He has a big time physique with big time aspirations. Not to mention a killer support system. Robert trains with pro bodybuilders to add size and keep his dreams alive! As a kid, I was on the heavy side. I would eat whatever I wanted and got to the point where my mom thought I had diabetes. I was borderline obese. So I decided that I wanted to make a change. At the age of 13, I entered a gymnastics class which made me lose lots of weight and gain muscle. My dad Joseph Willey, who is a LAPD officer, showed me his weight collection, some workouts, and I just stuck with it and grew. Working out plus gymnastics really helped. I joined the cheer team in high school which required a lot of lifting and squatting. I had to quit cheer due to a shoulder and back injury and took a break from gymnastics. That's when I got serious about bodybuilding. I would get compliments from people saying how big I was for only 16. So, I decided to start competing. And then it all just happened. I was now an upcoming bodybuilder who everyone knew about. 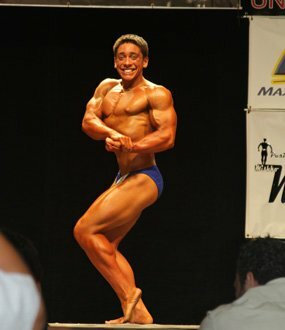 I recently got second in the NPC West Coast Classic and I personally feel I should have won. The drive to be first keeps me motivated during my workouts. I love how you can transform your body into something that many people can't do. My dad actually was the one who introduced me to working out and lifting weights. He was the first person to get me a gym membership in San Gabriel, California at Lou Greenburgs Health and Fitness Club. That's where it all started. I have to thank my dad for getting me into it all. My girlfriend Sara always supports me in everything I do. She would always tell me, "Do work baby" before my workouts and made me feel like I can do anything. Whenever I think of her, I feel invincible, happy, and warm. She allows me to push through my workouts. It's all mental. I'm currently in my off-season, but I'm training with pro bodybuilder Stan McQuay at Powerhouse Gym in Chatsworth, California. My next competition will be a big one that allows me to qualify for nationals. After that I plan to get my pro card. If you believe you can do something, then you can. If you believe in your head for once second that you can't, it's your biggest weakness. Train hard and push through everything. Never give up. Anything is possible. My favorite bodybuilder is Jay Cutler. He is my idol and I plan to be Mr. Olympia one day just like him. He is such a down to earth guy and a gentleman. That is why I look up to him. He's very humble and isn't one of those cocky bodybuilders who think they are the best. Jay Cutler is the best. If it wasn't for Bodybuilding.com I wouldn't have learned all the workouts I do today. When I first started working out, I would always look on Bodybuilding.com for different workouts and supplementation. I couldn't have done it without Bodybuilding.com. I would like to say thank you to my mom. She's been with me side by side, helping and supporting me through everything. She made everything I am today possible. Thank you, mom. I love you. I would also like to thank my sponsors, House Of Vitamins, for helping me with the best supplements. You always have what I need and you guys rock. Check them out at House Of Vitamins in Burbank, California located inside Powerhouse Gym Burbank. I would also like to thank my trainer Zoran Obravic. He helped me gain about 10 pounds of solid muscle. He knows how to transform your body from a twig to a tree.